CINQUERA, El Salvador- Solar water disinfection is the practice of making otherwise bacterially contaminated water drinkable by putting it in plastic bottles and exposing it to direct sunlight for at least six hours. 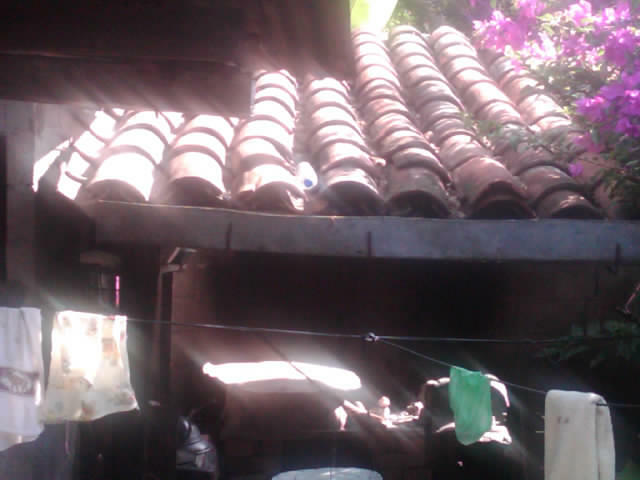 I have noticed plastic bottles filled with water sitting on the roofs of homes in El Salvador, and, when I come to think of it, I have noticed this at various points in my previous travels through South America. Though I did not fully recognize the purpose of it until I was poured a glass of water from a bottle that had previously been cooking on a roof in the rural highlands of El Salvador. I looked at the operation suspiciously, knowing that I was being giving water to drink that had not been purified through any means that I would have deemed effective. And taking mirrors off of the wall prevents lighting from striking a house (read: Remove mirrors when it rains). I was clearly suspect of this water disinfecting procedure — the water was not boiled, it was not filtered, it was not even treated with chemicals — it was just put in a plastic pop bottle and sat out in the sun. I had not yet known that solar disinfection can really make water perfectly drinkable. In solar water disinfection (SODIS), microbes are destroyed by temperature and UVA radiation provided by the sun. 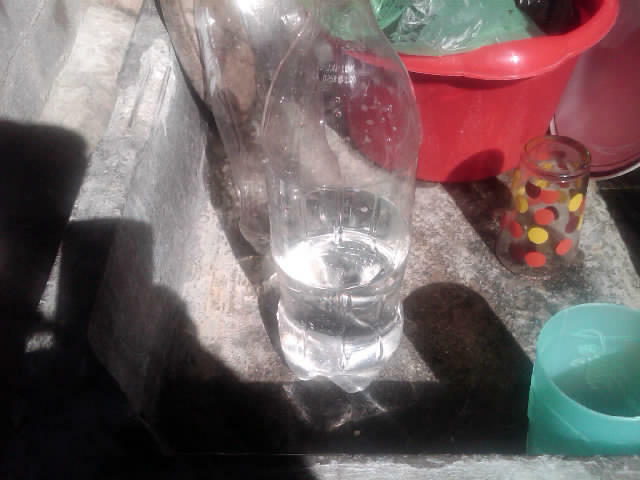 Water is placed in a transparent plastic PET bottles, which is first oxygenated by shaking partially-filled capped bottles prior to filling the bottles all the way. The completely water-filled and capped bottles are exposed to sunlight, preferably on a corrugated metal roof, slanted slightly to maximize the exposure to solar radiation. In practice, the water-filled bottles are placed for six hours in full sun, or for two days in partial sunlight for weather conditions involving partially overcast days, which raises the temperature of the water and gives an extended dose of solar radiation to the water in the bottles, killing almost all microbes that may be present. The combination of the two effects (UVA and heat) provides a simple method of disinfection for use in tropical developing countries, or in survival situations. The solar water disinfection uses the sun’s ultra-violet rays to kill germs in drinking water. The water is put in a plastic bottle and then in the sun for at least six hours. The method has been proved to kill E. coli, a bacterium that causes food poisoning, and one of the main causes of diarrhoea. It kills the bacterium when the water is exposed to the sun for a day when it is bright, or two days when it is cloudy. As applied to small volumes of water, it’s hard to beat solar disinfection. The only capital outlay is the cost of the bottles. The process requires no fuel and no chemicals. Just fill a bottle with water, park it in the sun for six hours and the germs are killed. Solar disinfection works on waterborne pathogens in three ways, including ultraviolet (UV) disinfection, a physical process in which the UV wavelength starts a photochemical reaction that targets the DNA of bacteria. The UV process works on Cryptosporidia, Giardia, and other parasites that can resist chemical treatment. Clearly, solar water disinfection is not a backwater rural myth — it works. My observations and experience backs this up: I drink solar disinfected water, I am not sick; people around me drink solar disinfected water daily, they are also un-effected. This is a simple way for purifying drinking water that can be done almost anywhere in the world: all you need is a clear plastic bottle, sunlight, and a few hours. Though a major criticism of this method is that chemicals from the plastic bottles may leech into the water, essentially poisoning the drinker with carcinogens and artificial estrogens. But at least the water is cleaned of bacteria, parasites, and viruses. First things first. Using plastic bottles is a highly toxic process for cleaning water. With the contamination of the water (through photodissociation) the water becomes contaminated with halogens (aromatic hydrocarbons) that are highly toxic, biologically accumulating, and persistent. The water “cleaned of bacteria, parasites, and viruses is now contaminated with highly toxic aromatic hydrocarbon such as benzine and bisphenol A. Drinking these chemicals can cause serious digestive disorders, circulatory disturbances, complications with function, malnutrition, dehydration leading to a host of “disease states”. This method of cleaning water is not safe nor would it pass international health standards. Water in plastic bottles has been reported (in Canada and US media) as a health danger. True, but plastic bottles for water have become the global standard. Just use a technology invented long before plastic: GLASS! Please note that this method does not get rid of chlorine, fludoride, growth hormones and other pollutants in the water! You can try to sell this to the Salvadorans, but I do not believe that they will buy it. Plastic bottles are way too cheap, plentiful, and durable to not use. This solar water disinfection method is used in El Salvador as a poor default to having clean water or other methods of cleaning drinking water at their easy disposal. If there were other methods as cheap and available as solar disinfection with plastic bottles, I am sure they would use them. I came here from your fabric UV cleaning article, and am really amazed that this IS, I mean it makes sense when you sit down and think about it, but it’s just so simple and in the face of what they try to push over here as clean water.